Did you know there are approximately 28 million small businesses in the United States alone? With a number like this, all small business owners are looking for a competitive advantage. Anything you can do to outperform your competition is something to consider. While there is no way of knowing what the future holds, one thing is for sure: you don’t want to be among the approximately 80% of businesses that fail within 18 months. So, what does this have to do with online marketing? It’s 2016 out there. Gone are the days when you could afford to ignore the internet. If you want to achieve success, regardless of your industry, it’s imperative to have a sound online marketing plan in place from day one. In the past, I’ve discussed a variety of tools for specific areas of internet marketing. For example, this post details the top tools for launching your first content marketing campaign. In this post, I’m going to outline three online marketing tools that you need when starting a business. Some of these may be new to you, but each one is well worth your consideration. Let’s begin! Get this: email marketing technology is used by more than 80% of B2B and B2C companies. This isn’t something you should wait on. Instead, you should implement an email marketing strategy on day one. History dating back to 2001, well before most companies began using email marketing. Self service support options, ensuring that you can quickly find answers to all of your questions. Free plan for those with less than 2,000 subscribers and those who don’t send more than 12,000 emails per month. When starting a business, it’s not likely that you will have more than 2,000 subscribers. For this reason, you can get started with MailChimp early on, using the tool for free as you get your feet wet with email marketing. When it comes to marketing, sales and CRM software, HubSpot has become one of the top players. There is no stone left unturned, when you rely on HubSpot’s all-in-one marketing software. That’s why it’s a top choice for those who are starting a business. With everything you need in one place, you don’t have to pull yourself in many different directions. This will help you to achieve greater success in the early days, as you’re sure to have many other tasks on your plate. As one of the top free tools from Google, Analytics should be part of your marketing strategy from the very start. It only takes a couple of minutes to add the Analytics code to your website, giving you the ability to track every action by every visitor. This is considered by many to be nothing more than a traffic tool, but it can actually have a big impact on your marketing strategy, if you know what you’re doing. Maybe you realize that a particular social media campaign is driving tons of traffic to your website. With this data, you can adjust your future strategy, in an attempt to capture the same results. Or, maybe you find that a particular set of keywords is doing wonders for your organic traffic. Again, you can turn your attention to these keywords, ensuring that you keep these in mind as you create content down the road. 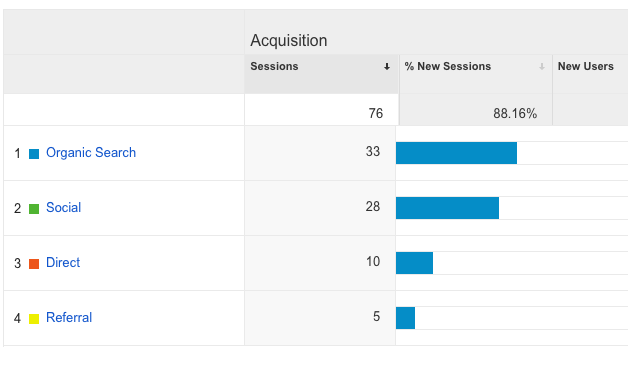 Google Analytics isn’t one of those tools that you should ignore. Installing this early on is a key decision, in regards to your online marketing strategy. The data you can collect and review is extremely valuable. Being part of this group means having a marketing strategy in place. Furthermore, it means using the right tools at the right time.